As far as bread making goes this if fast, tasty, chewy bread with a crispy crust. This method creates a wonderful artisan loaf. Best of all, this no-knead method does not require the use of a cast iron dutch oven or 18 hours of proofing time! Are you ready? Grab the flour and let’s get cooking! Mix the starter and yeast with the water. Allow this to sit and bubble while you measure the remaining ingredients. Measure the flours and salt into a large bowl. Make a well in the center and pour in the yeast, starter and water mixture. Stir with a wooden spoon to mix it all together. Cover the bowl with an oiled piece of plastic wrap and place in a warm place to rise for the next two hours. If your home is chilly, use the oven on a proof setting or set at 100°F. A gas oven with a pilot light is often enough warmth to proof the bread. The dough should double in size. Depending on how warm your proofing area is, this may take longer or shorter time than 2 hours. Now here is where it gets tricky. The dough is very wet and sticky. You do not want to handle it very much. Heavily flour your working station and your hands. 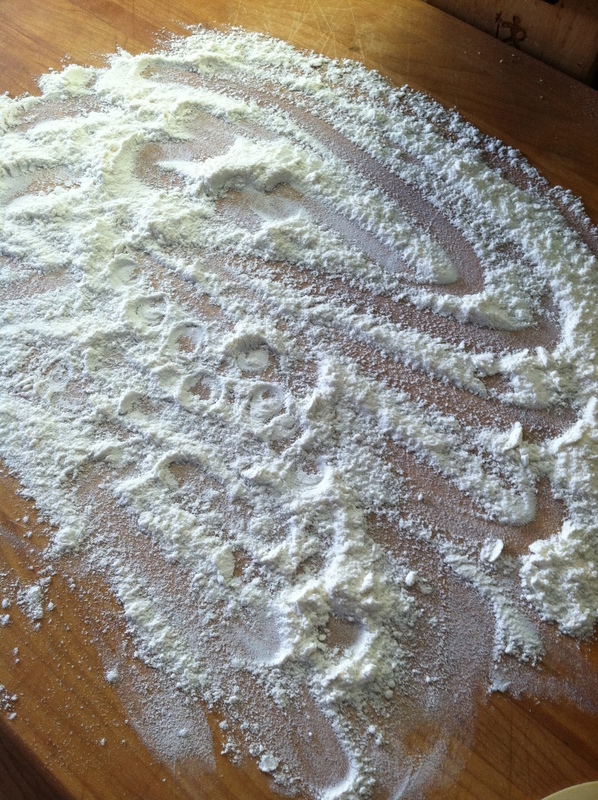 Remove 1/2 of the dough from the proofing bowl and place on the flour. 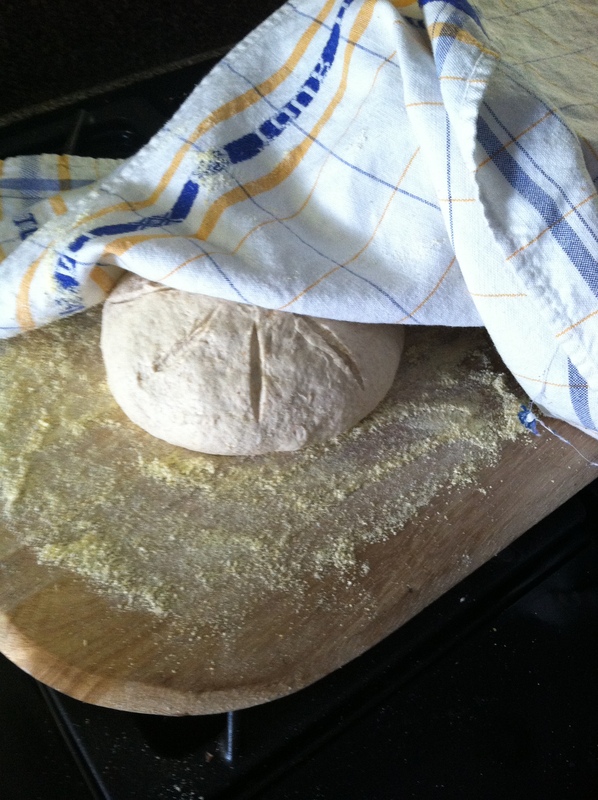 Cover any sticky spots with flour so the surface feels smooth and not sticky. 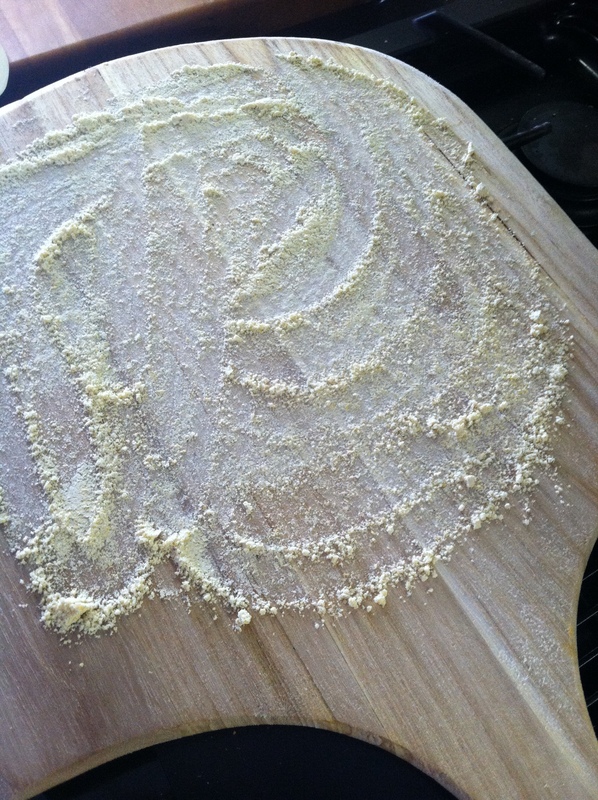 Using a well floured rolling-pin, work the dough into a rectangle about 1/2 inch thick. Fold the left edge over 2/3’s of the bread, fold the right edge over the folded left side. You should have three layers. Turn the bread 1/4 turn, roll and repeat 4 times. Lastly, roll into a rectangle. Take the edge closest to you and begin rolling the dough into a cylinder. Place a good layer of corn meal on the surface of the pizza peel; place the loaf on the peel, near the edge so the dough does not have a long way to slide when placing into the oven. Cover with a clean towel and allow to rise for about an hour. In the meantime, while the oven is cold, place the pizza stone on the middle rack of the oven. Place the broiler pan on the bottom shelf and remove the top shelf. You want the bread to have plenty of room to rise! Pre-heat the oven to 450°F. The oven needs to heat for 30 minutes at 450°F before baking. This ensures the temp is good and hot which is necessary for great ‘oven spring’. Bring 4 cups of water to a boil in something it is easy to pour, like a kettle. Once the oven has heated for 30 minutes and the dough has been rising for an hour, and the water is boiling, it is time to bake the bread. Now, you are going to look at it and say it is floppy and loose and not going to work. Trust me, just go through the process, be patient! You have to work quickly here. Decide what you are going to do and do it! Take the peel with the bread on it; remove the towel. 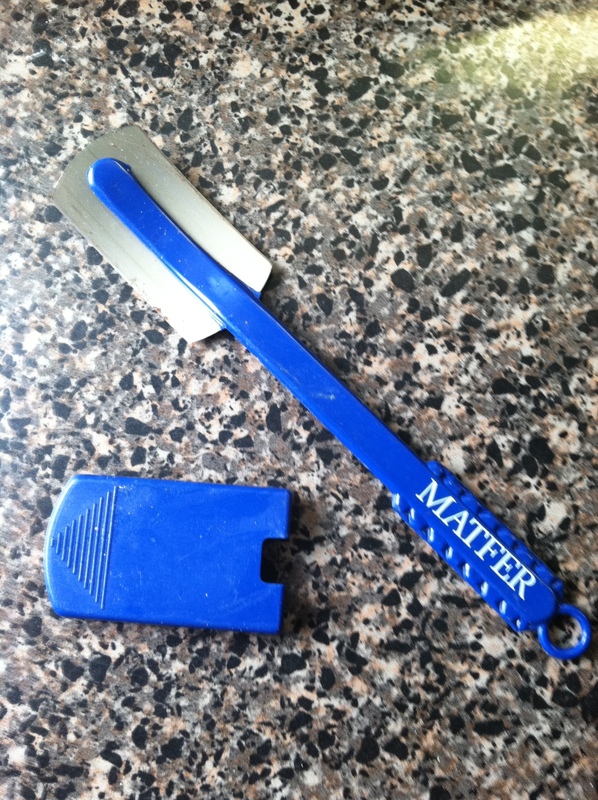 Using a razor blade or bakers peel, make 3-4 deep slashes across the top of the bread. This prevents the bread from breaking while it expands in the oven. 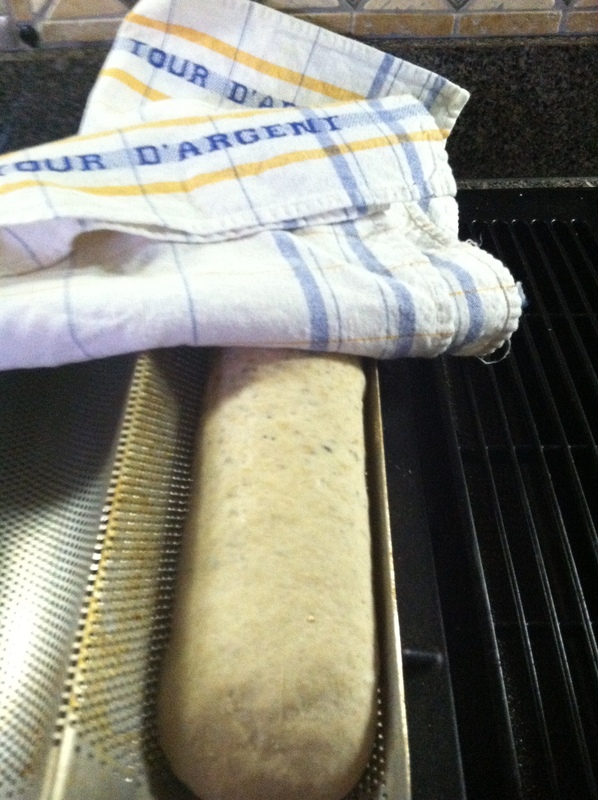 Open the oven door and with a quick firm motion slide the bread to the baking stone from the peel. A quick forward back movement is all it takes as long as you have enough corn meal on the peel. Hint: Once the bread hits the stone, don’t move it. Put oven mitts on your hands to prevent steam burns. Take the kettle of boiling water; open the oven door, pull the broiler pan out enough to easily pour the water into the pan. CAREFUL, it steams! Fill the bottom of the broiler pan by 1/2 inch. Quickly close the oven door so as not to let all the steam escape. The steam is what creates the crispy crust. Commercial bread ovens have “with steam” options, home ovens do not. There are several theories as to how to add steam in the home kitchen. One will tell you to spray the bread with water while it is cooking. Folks, if you spray cold or warm water on a 450°F light bulb in the oven, it will burst. Same with your baking stone: CRACK! So this is not a good method. Another is to brush the loaves with water just before putting them into the oven. This dough is already wet. Additional moisture would hinder a smooth slide from the peel to the stone. 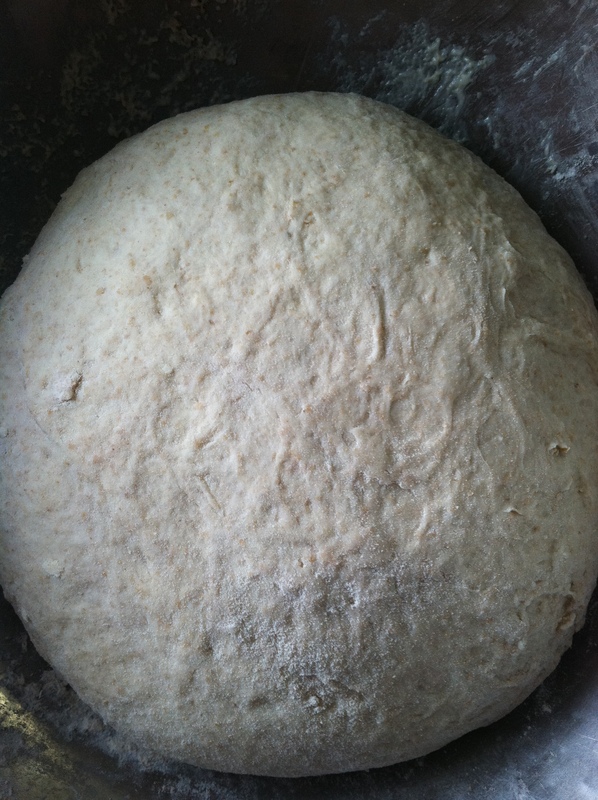 Besides the dough is so tender that brushing it at all would collapse whatever has risen. Slashing is all it can take. The broiler pan method is most useful. It does not endanger the stone or bulb. Just protect yourself from a nasty steam burn. After you have added the water and started to create the steam, close the door quickly then set the timer for 15 minutes. Make sure you have more boiling water at the 15 minute mark; open the door and add more water for more steam. Note the color and the rise on the bread! The amount the bread rises once it hits the heat is referred to as “oven spring” and this bread formula has great oven spring. Yay! In about 10 more minutes, remove the bread from the oven and take its temperature. When the bread reaches 190°F the bread is done. Remove from the oven and cool on a rack until it is cool. This entry was posted in Recipes, What every good cook should know and tagged Baking, Baking stone, Bread, cooking, Dough, Flour, no knead bread. Bookmark the permalink. It looks great, but anyone letting bread rise for 12 to 18 hours is being ridiculous! What a waste of time when you could be tucking into some lovely bread. So right! Time is nice when you have it but if you have a good starter, the flavor is always there. I loose patience with the long time required of some bread recipes resulting in not making bread. I love to make bread. . . and eat it too. 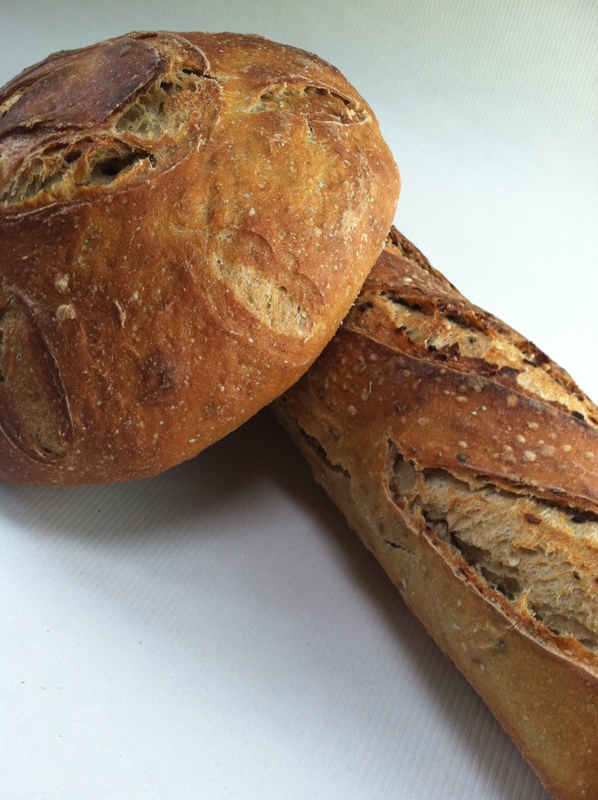 wonderful looking bread and very entertaining and straight forward instructions. you do seem like a pro at bread baking 🙂 ps: most of the times, a long fermentation does not really take our time…. the ferments do all the work while we are doing other stuff. Hi Barbara,Thanks for reading my blog. I now keep a sour culture going so I can have that long fermented flavor without all the time invested developing the flavor. 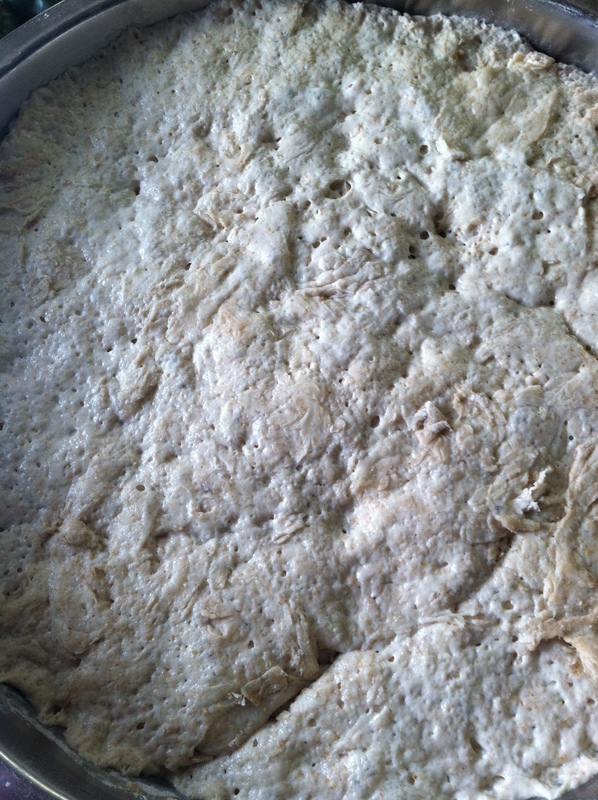 Love that fermenting thing and how a good dough feels. Can’t wait to spend some time reading your blog, thanks for looking at mine! Can you please post the recipe you mentioned using the sourdough starter for pancakes? yumm, I’ll be trying this recipe out, thanks! Please, let me know how it turns out for you! The best bit of advice is to keep all sticky spots on the dough sprinkled with a bit of flour. 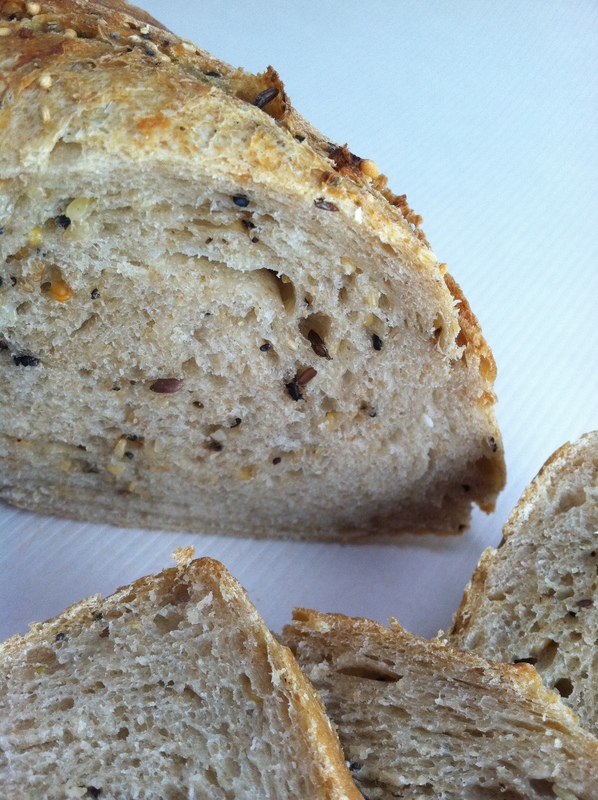 The dough handles different than regular bread but it works great and tastes fantastic.